All of the ships except the drydocked Pennsylvania were moored along Ford Island in the famous ‘battleship row’. I’m going to focus on the stories of the individual ships during the attack, moving north to south. 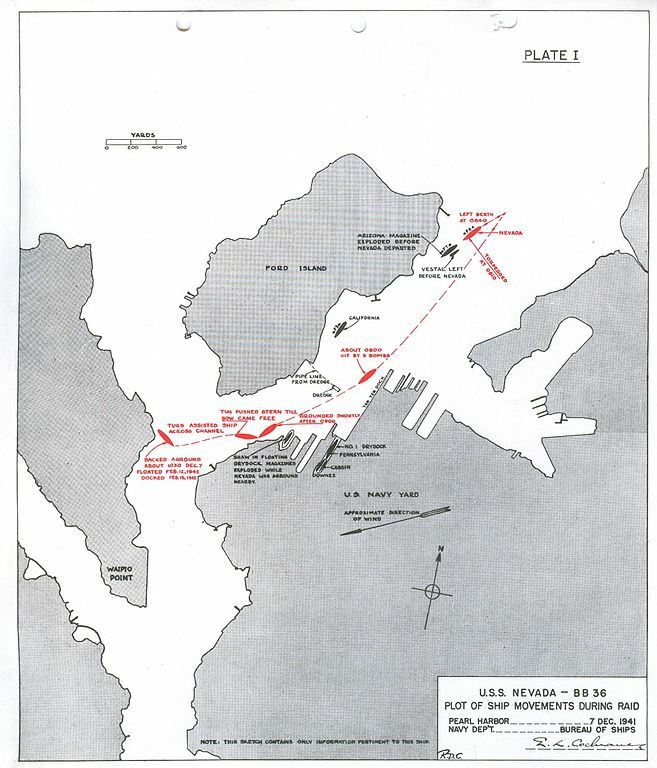 The attack began at 0748 on Sunday, December 7th, and a total of 353 Japanese aircraft were involved, in two waves. 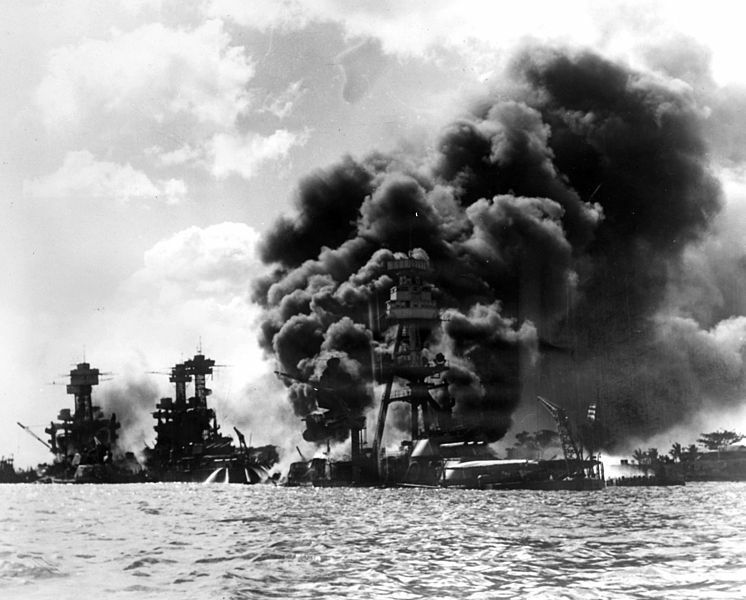 At 0840, Nevada got underway, the only battleship to do so during the attack. She initially made for the exit from the harbor, but was redirected to stay within the harbor due to fear of mines. During the second wave, she was hit by at least five bombs at around 0950, badly damaging the forecastle and bridge and starting fires throughout the ship. There was insufficient watertight integrity high in the ship, and water was able to flow aft from the bomb holes. Nevada was ordered to beach herself to avoid blocking the channel when she sank, but had turned in a very good performance under the circumstances, despite losing 50 men. Arizona, ahead of Nevada at the start of the attack, did not fare nearly so well. She took four bomb hits from high-altitude level bombers in the first few minutes of the attack. One ricocheted off the face of Turret 4, and detonated in the captain’s pantry. Another struck near the mainmast, and a third near the rear AA guns. 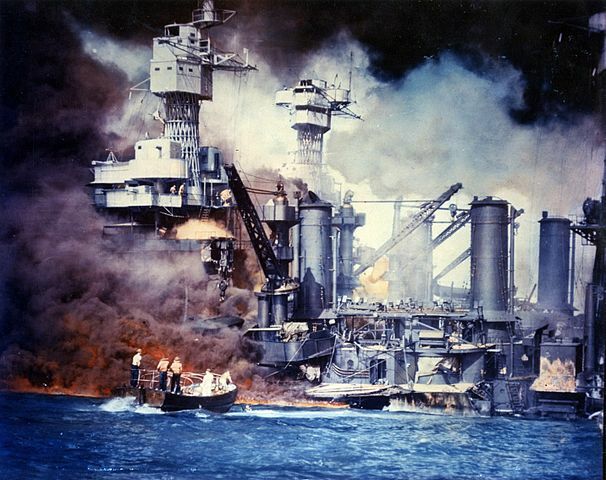 The fourth bomb, though, ensured Arizona’s place as one of the most famous battleships ever. 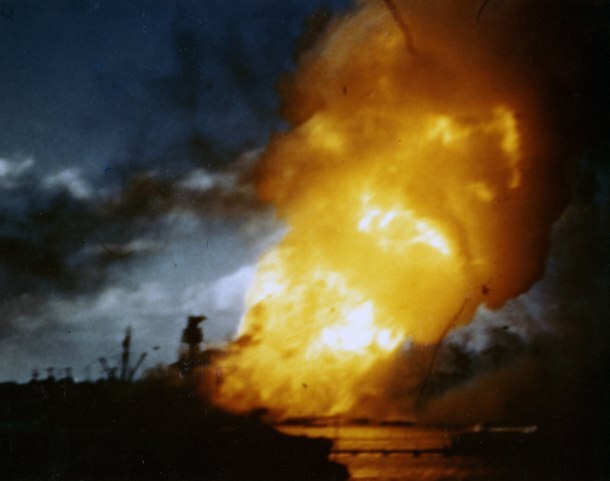 There is still some controversy over what the bomb that struck near Turret 2, set off, seven seconds after the impact, a massive explosion of Turret 2’s magazine destroyed the center of Arizona, collapsing her foremast, and putting her on the bottom so fast she did not have time to capsize. About 1100 of her 1500 crewmen died with her. 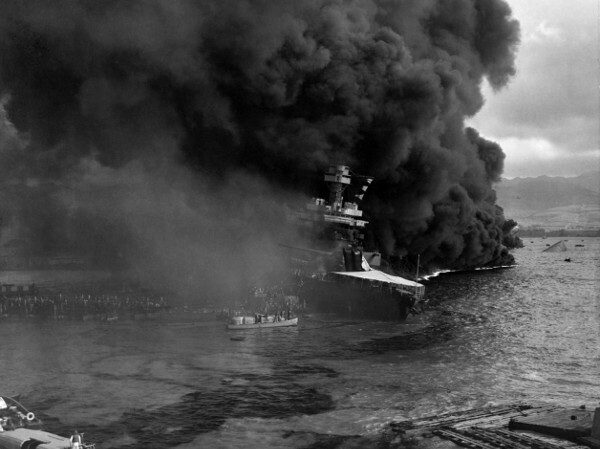 West Virginia took the most damage of any battleship, two bombs and an estimated seven torpedoes. The torpedo defense system (TDS) she shared with Maryland, California, and Tennessee was one of the most effective ever designed, but she was badly overloaded, and none of the torpedoes hit the TDS cleanly. One hit aft, damaging the steering gear and rudder. Three struck below the armored belt, and another struck the belt directly, requiring the replacement of several plates when the ship was repaired. One or two, hitting after West Virginia had begun to list, actually went over the belt and through holes made by previous torpedoes, detonating on the armored deck. A final torpedo was recovered and disarmed by EOD technicians. Both bombs failed to explode, one having penetrated into Turret 3. 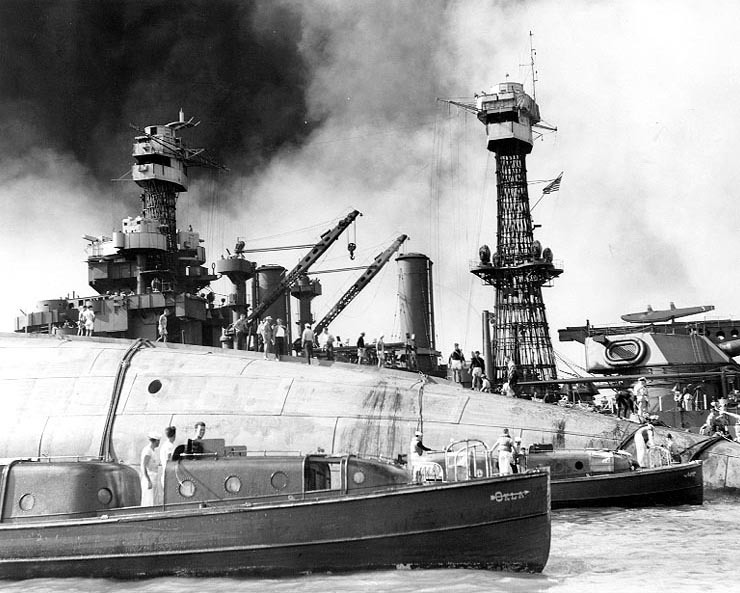 Fires took 30 hours to extinguish, and only prompt counterflooding and the presence of Tennessee inboard of her kept her from capsizing before she sank to the bottom. Among the 106 dead was the Captain, who was subsequently awarded the Medal of Honor for his actions after being wounded. Inboard of West Virginia, Tennessee was protected from torpedoes, and escaped relatively lightly on the bomb front, too. She took two hits, one on Turret 2, which disabled the guns and killed West Virginia’s captain, and the other on Turret 3, disabling one gun in that turret. 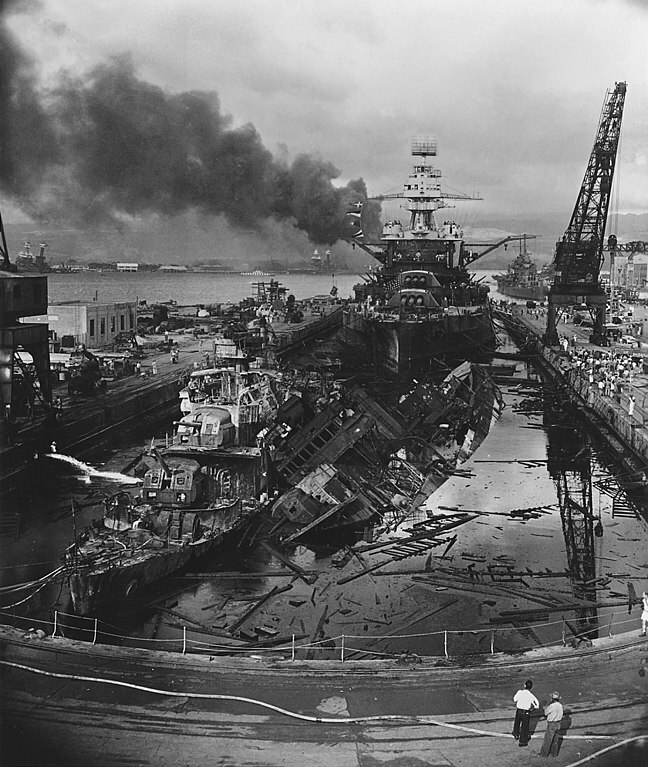 Most of the damage she took came from debris and oil from Arizona, although her crew managed to keep her mostly intact. Only 5 men aboard died, although it took them until the next morning to finish firefighting operations. 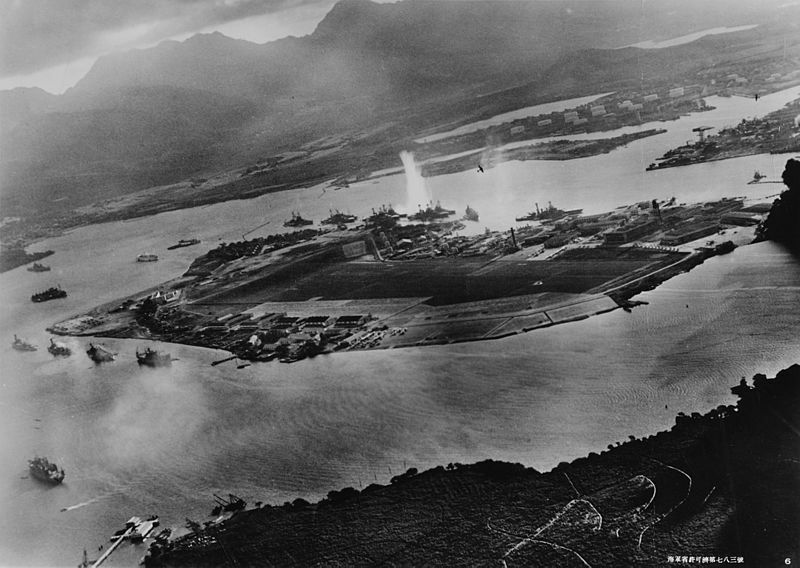 Oklahoma took three torpedo hits moments after the first bombs fell on Ford Island, and began to list 25 degrees immediately. The order to abandon ship was given, but 415 men failed to get out before she capsized, her masts digging into the bottom of the harbor. Her roll was aided by two more torpedoes on the armored belt as she went over. Many of Oklahoma’s crew swam over to Maryland, inboard of her, to aid in fighting her anti-aircraft batteries. 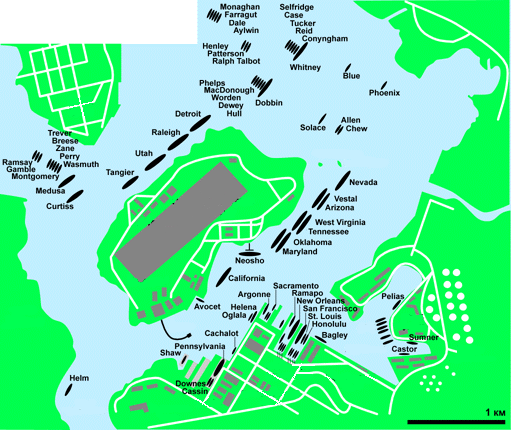 Maryland, protected by Oklahoma’s hull, survived with only a single bomb hit forward, which missed anything vital. Only 4 men of her crew were lost. California was moored at the south end of Battleship Row on her own, and took two torpedo hits on the port side at 0805.4 Despite her excellent TDS, which was not penetrated, she suffered extensive flooding. Some hatches were open for maintenance pending an inspection, and Morison suggests that her watertight integrity was generally poor due to a focus on polish as a flagship. Counterflooding kept her level, and the crew manned her anti-aircraft guns, using human chains to pass ammo up when the power failed, and did their best to keep her afloat. 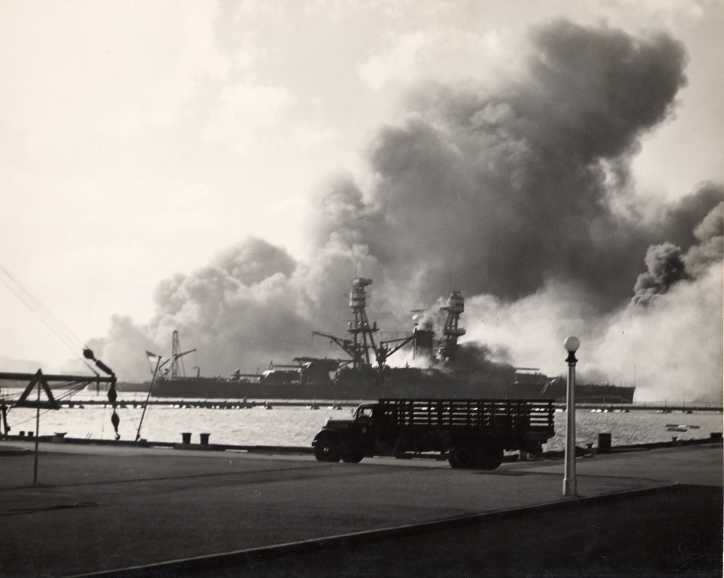 However, a pair of bomb hits later in the attack and burning oil from the other ships forced them to abandon the pumps, and California settled, finally coming to rest on the bottom on Wednesday, December 10th. 99 of her crew were lost, including two men, Robert R. Scott and Thomas Reeves, who were posthumously awarded the Medal of Honor. Pennsylvania, the fleet flagship, was in drydock with the destroyers Cassin and Downes forward of her. This protected her from the aerial torpedoes that did so much of the damage to the other ships. Attempts were made to torpedo the caisson (door) of the drydock, but failed. She opened fire on the planes at 0802,5 and only took one bomb hit during the second attack, which damaged the boat deck and some of the secondary 5” guns. However, Cassin and Downes were badly hit by bombs, and Pennsylvania was damaged further when torpedo warheads on Downes exploded. The drydock was swiftly flooded to extinguish the fire aboard the destroyers.6 Morison gives 18 killed aboard, although I’ve seen other numbers, too. On the other side of Ford Island was the USS Utah, a former battleship converted into a AA training/target ship. She took two torpedo hits early in the attack, and quickly joined Oklahoma on her side. Next time, I'll cover the post-attack careers of each ship. Some never returned to service, while others played key parts in the later stages of the war.